NASA has delayed the second of three planned holiday spacewalks by 24 hours, setting up a Christmas Eve (Dec. 24) excursion from the International Space Station for two astronauts. The agency made the decision after noticing an issue with the spacesuit of Rick Mastracchio, who ventured outside the orbiting lab with fellow NASA astronaut Mike Hopkins Saturday (Dec. 21) to address a problem with the station's cooling system. Water may have entered part of Mastracchio's spacesuit in the orbiting outpost's airlock after Saturday's extravehicular activity (EVA), NASA officials said. So the flight control team at the agency's Johnson Space Center in Houston have directed Mastracchio to use a spare suit for the next spacewalk, which was originally planned for Monday (Dec. 23); the extra day will allow the station's crew to resize the suit for him. "Both Mastracchio and Hopkins reported dry conditions repeatedly throughout Saturday's activities and the two were never in danger," NASA officials wrote in a press release after the spacewalk. Mastracchio and Hopkins are tasked with replacing a faulty pump module that's part of the International Space Station's cooling system. A valve in the module malfunctioned on Dec. 11, requiring some systems aboard the orbiting lab to be shut down. The issue does not threaten the safety of the six crewmembers currently living and working on the station, officials say. 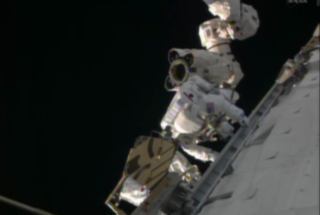 Mastracchio and Hopkins made good progress during Saturday's spacewalk, meaning the third EVA may not be necessary. That last excursion was originally slated for Christmas Day (Dec. 25), but it will almost certainly be pushed back now, if it happens at all. The Christmas Eve EVA is scheduled to begin at 7:10 a.m. EST (1220 GMT). You can watch it live here on SPACE.com beginning at 6:15 a.m. EST, courtesy of NASA TV. The spacewalks have delayed the first contracted cargo mission of aerospace firm Orbital Sciences' unmanned Cygnus spacecraft, which was scheduled to launch toward the orbiting lab on Thursday (Dec. 19). That liftoff will now likely occur no earlier than mid-January, NASA officials have said.